Builds family economic security by ensuring workers can care for their health needs without losing a day’s wages or even their job. Protects public health by encouraging sick workers and children to stay home, away from co-workers, school, and customers. Lowers health care costs by enabling workers to seek preventative care and early treatment for themselves, their children, and elderly parents. Creates healthier workplaces, and more productive and profitable businesses by limiting the spread of disease, reducing the potential for workplace accidents, and boosting employee productivity, morale and commitment. 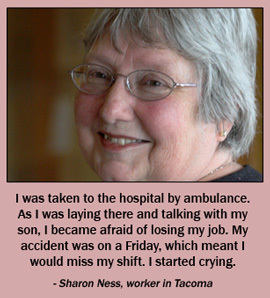 Family Economic Security: In Tacoma, nearly 40,000 workers – 41% – have no paid sick leave, losing income they’d otherwise spend in local businesses when ill. For nearly three-fourths of school-age children in Pierce County, both parents work. Parents without sick leave are less able to stay home with an ill child, sometimes being forced to send the child to daycare or school, or keep an older child out of school. Public Health: 78% of restaurant workers, 55% of retail workers, and even 29% in health care don’t have sick leave. The Center for Disease Control urges people with the flu and other contagious illnesses to stay home, but even some with paid time off face disciplinary measures if they call in sick. Health Care Costs: Not only does preventative care and early treatment lower costs, but people recover more quickly and hospital stays are shorter when loved ones are present, and care by family members avoids costly nursing services. Healthy, Productive and Profitable Workplaces: Even minor illnesses reduce productivity and increase the chance of accidents, and sick workers spread disease to co-workers. Studies show paid sick leave boosts morale, commitment, retention, productivity – and profits. When San Francisco passed a Paid Sick Days ordinance in 2006, the city had stronger job growth than surrounding counties the year after.